The Mollett Victorian Bulldog is large-headed and thick-boned, but only to the point that it does not impede vigor. It is broad-muzzled and short-faced, but not so excessive as to interfere with breathing. The hindquarters are somewhat higher and not as heavy as the foreparts, but not so as to destroy the symmetry of a muscular athlete. The head should be large, but not exaggerated out of proportion to the body. The cheeks are rounded and extend sideways beyond the eyes. The face is measured from the front of the cheekbone to the tip of the nose, long enough for unhindered breathing. The muzzle is broad and turning up, undershot but not to excess. The nostrils are large and wide; black is preferred but Dudley acceptable. The flews are broad and hang over the lower jaw at the sides. The canine teeth are large and wide apart. The eyes from the front are set low and wide apart, never bulging or sunken and never with the haw visible. The ears are either rose or button and are never erect or cropped. The neck is thick, strong and arched, with loose skin forming dewlaps on each side. The shoulders are broad and deep. The Mollett Victorian Bulldog has rounded ribs with a wide chest narrowing toward the loins without exaggeration. The forelegs are muscular, straight and wide apart, not bandy or curved. The hind legs are strong and muscular. The hocks are slightly bent. The feet are round and compact and either straight, turning down or screwed. The coat is smooth and short. Colors include all brindles, solid white or pied, solid red, fawn or fallow. Black or black and tan is not acceptable. 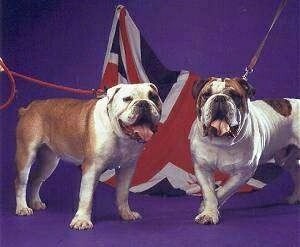 The Mollett Victorian Bulldog is very loyal and absolutely reliable. Although its appearance can be somewhat intimidating, it is among the gentlest of dogs. Just the same it will see off any intruder. It is described as a very affectionate and dependable animal, gentle with children, but is known for its courage and its excellent guarding abilities. The Mollett Victorian Bulldog is very much a people’s dog, seeking out human attention and loving every bit it can get!! Human attention is required for the breed's happiness. These dogs are nice to all people. This breed is good with family pets, but they can be scrappy with strange dogs without enough leadership from the owner. Some snore very loudly, and some have drool and slobber tendencies. Be sure to always be your dog’s pack leader. The Mollett Victorian Bulldog has no inherited health defects. The Mollett Victorian Bulldog is good for apartment life. It is inactive indoors and should at least have a small yard. This breed is an indoor dog. Mollett Victorian Bulldogs do best in temperate climates, as the breed can chill easily in cold weather and have trouble cooling off in very hot weather. The Mollett Victorian Bulldog can walk for miles; in fact it demands hearty exercise and would love a good run. It needs to be taken on a daily walk. In London in 1985 a breeding program began, led by Mr. Ken Mollett. Mr. Mollett was saddened to see so many unhealthy bulldogs and wanted to bring back the original, taller, healthier bulldog of the 1800s. With the passing of the years, Graham Woods and Ken Mollett's brother Derek, both early partners in the program, gave up or sought other goals, but Ken persisted. Using only bull-breeds registered with the Kennel Club of Great Britain and anchoring his program firmly on the modern bulldog, he set about crossing Staffords, Bullmastiffs, Dogue de Bordeaux and the healthiest Bulldogs he could find. Mollett selected carefully and every animal used was the best available. 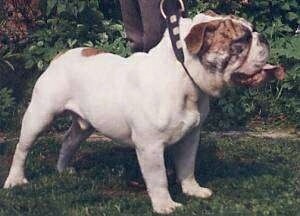 In the late 1980s the dogs being produced and bred by Derreck Mollett and Steve Barnett were utilized and used by Ken Mollett as the direct foundation dogs for his Mollett Victorian Bulldogs. Working from old photographs, statues, written descriptions and engravings, he set out to remake the dog pictured in Victorian times. He called this dog the Victorian Bulldog. Today the type is fixed and the dogs are breeding regularly to that type. Ken Mollett insists, however, that since the health of his dogs is more important than their looks, the standard should not be viewed as a straightjacket. 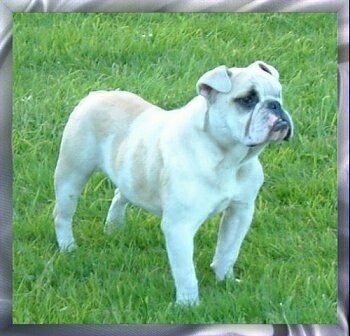 Similar to what happened in the USA to the Olde English Bulldogge of Mr. David Leavitt, where breeders of alternative strains bred Bulldog types together and wrongly used the name Olde English Bulldogge for its popularity, so can be seen with Mollett’s Victorian Bulldog. Mr. Mollett named his strains Victorian Bulldogs. As the Victorian Bulldog became popular, other breeders started to create their own strain of Bulldogs and called their dogs Victorian Bulldogs when the dogs were not related to Mollett’s strains at all. 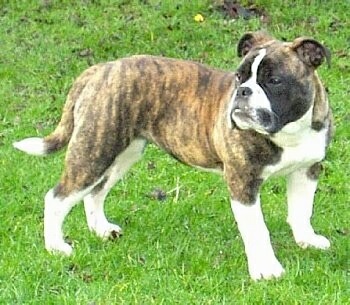 Some Bulldogs using the name Victorian Bulldogs are just first- or second-generation crosses.